Made with a bottom layer of 2 ply medical grade paper and a top 1 ply layer of water resistant poly, these disposable waterproof patient bibs for dental offices protect patient clothing from fluid drips and splashes and bits of flying particles during procedures. Measuring a generous 13” x 18”, these patient bibs are also often used to cover unused equipment during procedures, offering protection against contaminants, maintaining sterility, and cutting down on clean up time between patients. Available in packs of 500, choose between 7 color options: lavender, apricot, green, blue, yellow, pink or white. 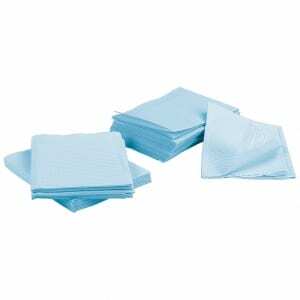 PlastCare USA disposable patient bibs are a preferred choice of dentists across California and are also widely used by medical spas and tattoo artists.